Do you like dogs? What are you? A monster? Of course you do. Well, you have been called on by a divine power to help out your best friend (if you call yourself a man). Chloe, the three legged dog, has broken her only front leg. She has had many expensive surgeries to repair it, and she needs help from you, Scrooge McDuck, because the Obama still hasn’t passed public pet care. Talk about hope! Really though, it is a fun event where you get to drink to heal this dog’s only front leg. Drinking and healing? What’s the catch? There is none unless you are Michael Vick. 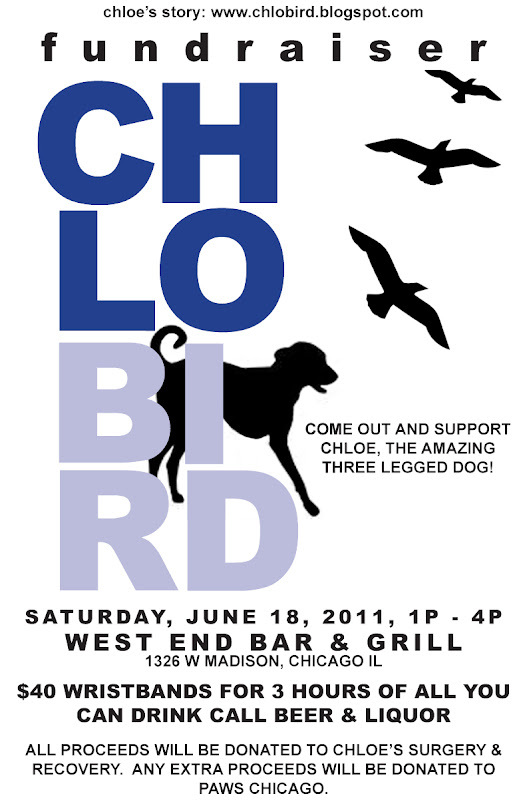 So come out to West End Bar next Saturday, the 18th, at 1pm. All additional proceeds will go to PAWS Chicago. And please check out Chloe’s story here. PLAN OF THE CITY from Joshua Frankel on Vimeo. I’m a sucker for anything 8-bit game related. Found it a bit curious to stumble across this RepoMan post after recently referencing it when discussing an imperfect film being perfect simply by how original it is (if you’ve talked to me more than twice you probably are aware it’s my favorite film that no one else seems to like). Also strange, was watching Alex Cox discussing the reviews that killed his film Walker just after finishing a book that touched on the politics surrounding the conditions in which the film was made and the media’s role in silencing such things. “No explanation. No point in lookin’ for one, either. It’s all part of a cosmic unconsciousness.” Miller was right on. Image search for this post lead me to this bit of 1984 nostalgia …and a feeling of utter vindication based on some of the films it beat out with its #7 ranking. In your face, Frint. And big thanks to my friends at PrairieMod for bringing this photographer / NG article to my attention.